I went to the CASANA* conference and the only tangible thing I got was a wristband that says “Every Child Deserves a Voice.” Boy, the learning and memories, though! They will change our lives. I have so much to say, and I’ll be writing about a lot of it in the coming days. Next year’s conference will be in Pittsburgh, so maybe that’s more convenient for your family, and you can start planning for that. I seriously can not recommend it highly enough. Having a huge room of people all with the same intent (“How do I help my child/my client/my grandchild with apraxia?”) feels so different. They all understand. 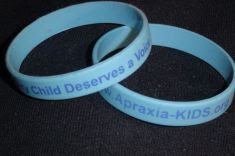 * Childhood Apraxia of Speech Association of North America. I call it apraxia on my blog, but the real name is CAS, Childhood Apraxia of Speech. That differentiates it from the other major form of apraxia, which occurs in adults after a stroke. I was there too and while I left with more $$ spent on tangible things than you did...I do agree that the best thing to come out of it was the friendships, connections, and knowledge as well as the general bonding of the group who were all going through the same thing as you! Glad I met you girlfriend!